Though the earliest English fortepianos were small domestic “square” instruments, modelled from the early 1760’s by immigrant builders such as Zumpe, Buntebart, Beyer, Pohlmann, Ganer, Geib, Pether and Schoene on the tafelklaviers of their native Germany, grand fortepianos of the Italian (Cristofori) type began to be made shortly afterwards by apprentices and associates of the great Euro-English harpsichord makers Burkhardt Schudi and Abraham Kirkman. The first of these associates was Americus Backers, who “invented” the English grand action and from 1770 placed instruments mechanically similar to Silbermann’s mid-century versions of Cristofori’s grands in the Sheraton-type cases already used for English harpsichords. By the 1780’s, Broadwood was building instruments of guaranteed quality using the “mass production” methods of the time, while more individualised techniques were used by the Kirkmans and Broadwood’s fellow Scot, Robert Stodart, who had opened his own workshop in 1775. This instrument is one of the last of the earliest type of English grand to have been made. Its measurements are identical with those of earlier grands by Robert Stodart, who in 1793 handed over the business to his son and nephew; a 1795 grand by the younger Stodarts has a 5-1/2 octave F-C compass and divided bridge.?? By 1793, the year in which Stodart handed over his workshop to his nephew Matthew and son William, his instruments were so famous that no less a luminary than Josef Haydn visited the workshop and wrote his three last “English” fortepiano sonatas, dedicated to the virtuosa Teresa Jansen-Bartolozzi. It seems quite possible this instrument was built by Robert around 1790, was in the shop during the change of management, and received its “Matthew and William” nameboard in 1793 in order to give an impression of modernity. While these sonatas may have been intended as much for Broadwood and Kirkman instruments as for Stodart’s, the fascinating possibility remains that our instrument, from the same year, is very likely to have been in the workshop during Haydn’s visit, and he may even have played it! It is almost certainly the earliest functioning grand fortepiano in the country. 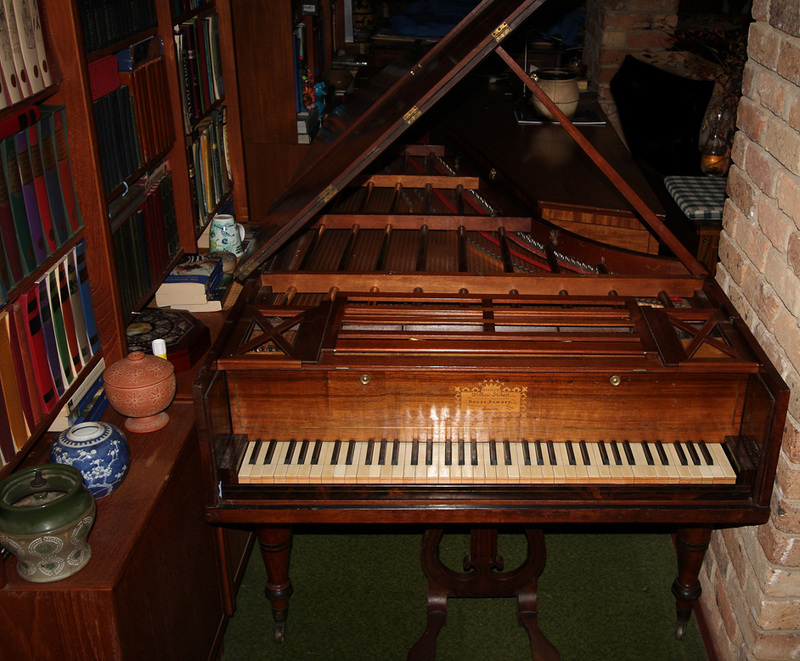 Though this 1793 instrument is virtually identical to Backers’ prototypes of twenty years earlier, the English fortepiano changed dramatically thereafter. By 1795 the bass part of the bridge had been detached from the remainder and relocated on the soundboard to allow a more effective striking point on the bass strings; the compass had increased to 5-1/2 octaves to meet the demands of virtuosi such as Jan Ladislav Dussek, the resulting increase in width necessitating transposition of pedals from the front legs to a lyre mounted below the centre of the instrument. Ten years later the compass had increased yet further to 6 octaves, imposing deformation stresses on the case and compromising tuning stability; builders responded by making instruments larger, with thicker timbers, and various means were employed to increase tuning stability. While Broadwood introduced bolted solid metal bars to prevent movement in the timber frame, William Stodart accepted that this movement would occur. In 1820 his workmen, James Thom and William Allen, attached hollow metal tubes to the frame, brass over brass strings, iron over iron, so that temperature-induced changes in string length and tension would be balanced by changes in the “compensation frame”, and the instrument would remain in tune. The compensation frame remained standard to 1850, and the firm ceased production in 1861. As an instrument of identical dimensions in the Victoria and Albert Museum, dated c.1820, lacks a compensation frame, and as all other known compensating grands have compasses of 6-1/2 octaves or more, it is possible that our instrument is the earliest surviving example from the brief transitional period when the “compensation frame” was an optional extra.